Diana Gaines of The J. 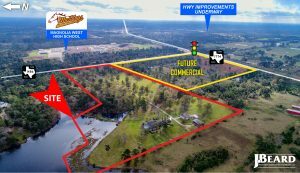 Beard Real Estate Company has represented Chris and Gail Osborne in the sale of 35 acres of land located at 505 FM 1486, Magnolia, TX, to Lone Star College. Lone Star College was represented by Ed Ryland, Elgin Wells and Tiffany Ryland of Arvo Realty Advisors. The property will be home to the new Lone Star College-Magnolia Center, expected to open fall 2021. The new center will be located across the street from the Magnolia West High School Campus and will feature classrooms, workforce labs and shared learning spaces to provide general education courses necessary for transferring to a four-year institution and select workforce programs that will help address the skilled workforce shortage in the Magnolia community. The total cost of the 65,000 square foot facility is expected to be $28.9 million which includes the price of the property, according to Lone Star. The J. Beard Real Estate Company, LP, headquartered in The Woodlands, TX, is a commercial real estate brokerage firm that offers services which encompass leasing, brokerage, site acquisition, property management, development, consulting, and landlord/tenant representation services. The firm is considered an industry leader in commercial real estate with a primary focus on the Greater Houston market, including Montgomery County and North Houston. To learn more about The J. Beard Real Estate Company, visit www.jbeardcompany.com. Click to download Press Release. COPYRIGHT © 2019 THE J. BEARD REAL ESTATE COMPANY, L.P. All Rights Reserved.